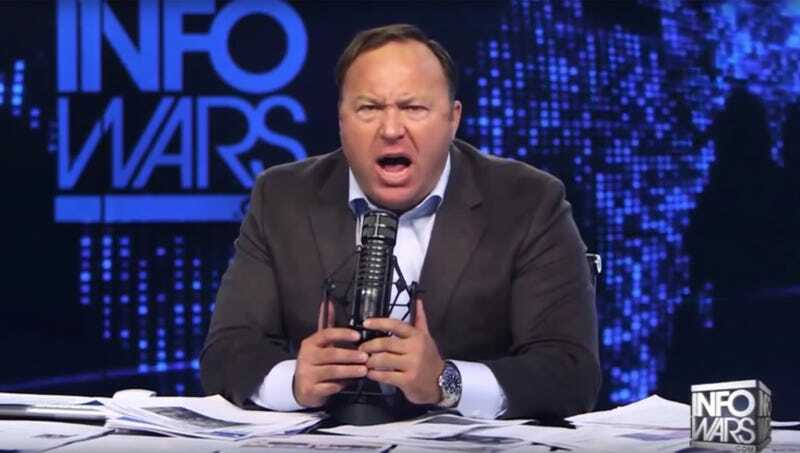 AUSTIN, TX—In the wake of allegations of sexual misconduct by two former employees at his site, InfoWars, a frothing, red-faced Alex Jones repeatedly claimed that sexual harassment was part of a worldwide imbalance in gender power dynamics. “Sexual harassment is just one aspect of a larger system, extending to every corner of the globe, that relies on perpetuating the patriarchal belief that women are inferior to men and encourages men to think they can and should dominate women both physically and psychologically,” said a sputtering, hysterical Jones in a 76-minute rant posted on YouTube, during which the 44-year-old ripped off his shirt and scrawled #YESALLWOMEN across his bare chest in red permanent marker and read from a tattered copy of Betty Friedan’s The Feminine Mystique while telling viewers that “the truth is all in here.” “The historical oppression of women is woven into the history, into the very culture of every government and institution in the world, folks—that’s how deep this thing goes. Feminists merely want you to believe the vast amount of empirical evidence demonstrating that sexual harassment is nothing more than the most overt physical manifestation of toxic masculinity in our profoundly unequal society! That’s what they don’t want you to know!” At press time, YouTube announced that the rant was Jones’ third violation of its community guidelines and permanently banned him from the site.